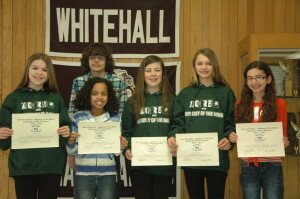 Whitehall’s Odyssey of the Mind team show off the certificates they earned for finishing seventh at the New York State Odyssey of the Mind competition in Binghamton. Pictured (L to R) are: Jessica Bruce, Colby LaChapelle, Jazmyn McCall, Morgan O’Dell, Courtney Wiskoski and Victoria Davis. Whitehall’s Odyssey of the Mind team returned from Binghamton with memories and fresh ideas after it finished seventh at the state-wide competition held last Saturday on the SUNY campus. The team compiled just over 247 points, finishing ahead of 10 teams in Division II that chose Pet Project as their long-term problem. Canajoharie Middle School won the competition with 340 points. On Monday, members met as a team for the final time as head coaches Sandy James and Karen Gordon gave the students a few final words of encouragement. “You all had your talents and you all were amazing,” Gordon said as other members of the faculty stopped by to congratulate the students on a job well done. Whitehall’s team, which is made up entirely of junior high students, qualified for the state tournament after winning a regional competition held at Queensbury Middle School earlier this month. The team, which has been meeting twice a week since September, chose one of five long-term problems that tests students problem solving abilities and requires creativity, spontaneity, and knowledge of subjects ranging from engineering to English. The problem, Pet Project, required the team to design, build and run three vehicles capable of delivering parts to an assembly area where they are used to make a pet. Once assembled, the pet is required to do a trick. The presentation is scripted and typically includes costumes and dialogue. The competition also includes a spontaneous component where students are presented with an unknown problem(s) they must solve. The team is evaluated based on the long term project, the spontaneous component and style. Whitehall’s long-term problem was judged as fourth out of 17 teams. The competition featured a total of 241 teams spread across three divisions. “Victoria’s plane worked awesome. It was seamless; it went forever,” James said. Many of the students were awed by the idea some of the peers had. Gordon said the team came into the competition a little nervous but gained walked away with increased confidence, something they hope to carry over to next year. “I learned not to put myself down,” Courtney Wiskoski said. “I know how to be more creative and think on the spot,” added Jessica Bruce.